This is just a quickly guide to ho to find cheap flight. Take a fly for cheap is the dream of everyone. Who didn’t dream to get a fly to the Coté Azur for just 10£ round trip? We did it. Was last January and actually is the cheapest flight we ever catch. Here is where we want to give some tips on how can find Cheap flight tickets. Just ridiculous price for a beautiful travel abroad. For us sometimes is more expensive to take commuters for reaching the Airports and come back at home after the trip, than to take the flight to another country. All of us want to travel as much as we can. Sometimes, you don’t need to get your bank account in red, or plan a budget apart. Now we will give you the chance to find flight ticket for less. 1. Find the Airline error fares. A cheap flight ticket with some search. Sometimes, the Airlines make a mistake to put online the prices of the flights. Sometimes it is a human error, and you need to be there to taking advantage. How do you do? It’s easier than you expect. There are some websites do it for you. Some of it are Secret Flying or Fly4Free. You need to bear in your mind, you need to get a good flexibility to get it and don’t need to be stressed to wait. The only things you need to do is to act really quickly and book your flight as soon as online. You don’t know how many times Alessia push for book another trips, and I need to keep the calm and wait a bit longer but match our budget and our desire for new adventure. You can be up to date installing on your mobile an app. PushApp is a free tool, help you to reach the new post from the principal site of fare finder and get you a notification. You can choose for a premium solution for some of this website. They give a priority to the premium members to get the notification as soon as noticed the mistake. On the other side, keep in your mind, the companies can cancel your ticket. They are allowed to cancel mispriced tickets. So allow you a bit of time to book the rest of the trip, just for don’ waste other money and you need to pay later the full price for the ticket for your destination. What we do is to wait like 4-5 days and then book our accommodation. Sometimes we wait for it as well, because we can find a deal for our couch as well. 2. Get Anonymus and do the flight searching undercover. Its happened to you to get your flight ticket price changing from one day to another, from one hour to another?. To us happened few times. We started to recognize it and investigate it. The conclusion is The Airlines and other searching tools, using the cookies when you do a research online for your flight. So they know very well what is your destination before you book your ticket. If you search your flight ticket few times, repeatedly, they understand you are tracking your future flight. If you don’t want to allow them to recognize your search, start your research with the incognito option of your browser. If you don’t have it, use the private mode. Chrome: Click More (menu icon), select incognito, the man with the hat. Firefox: Click More, this is the menu. Than Select incognito window. Like you are using google to find the best post suits for you, the same it is for flight or accommodations. You can easily use the search engines for a flight online to find the best solution for you. Could be really easy to find a chance to get a good flight to go with a company and the return with another. After that, you can go to the company website and book your ticket, but with this trick, you can save time and money. Sometimes the rates of the flight’s engine search are more high respect the brand company, so don’t take this prices like true, go and search for sure. Never book the flight without some research. Be carefully and flexible, could be less expensive one day more or one day less. We usually use this Flight Engine sources. 4. Flexible dates and hours. Even just for a vacation, maximum flexibility on the place where to go. To get a cheap price for your next flight you have to be flexible with your dates. Yes, this is one of our best secret for travel for cheap. We are not saying to you, you need to go at the date the flight company tell to you, but to put yourself in a comfortable zone and plan it about the offer, for a date, time and destination. If you are not sure about the day, you can check about the month or check about the best period for your trip in three month period. Also, you can set on some websites, like for Ryanair search tools, for length trip of just three days or more. 5. Flexible Destination is the best way to do an Adventure. Don’t take the flexibility like a gap between your next travel and your budget. Establish it like a jump in a new adventure. If you want to travel for cheap you need to leave to the budget some flexibility, about the date or about the destination. You can easily check for cheap flight tickets using Kayak Explore or Momondo. You can check the offer about the nation you want to visit or the continent. 6. Alternative routes or nearest airport. If your flight ticket is too expensive, you could still have some chance to save money. If you don’t have alternative dates or times, you can still do some research. It could be cheap if instead to land in the closest city airport, you have a look at the nearest airport. After have checked it, I will suggest you check the cost to get to the city centre. You don’t need to evaluate just the flight cost, but also the collateral transports. On our personal experience, could be also a money savers if you check for alternative routes. We went on a round trip to Naples of 72h but the ticket prices at last minute were too high. We tried to save some money on our flight back, the most expensive one, landing in Munich (Germany) for a 4 hours layover. At this point, we saved more than 200£. It is really a lot. 8. Price alerts – Offers and prices change directly to your email. You have to plan a trip, and you have checked already some good offer but you still don’t take the decision to take the tickets. Do you know you can set up an alarm for getting noticed when the price change? Yes, there is this option in a lot of flight search engine. Also if you check your flight on momondo, there is a section on your left, telling to you if the price is good or could be better. 9. 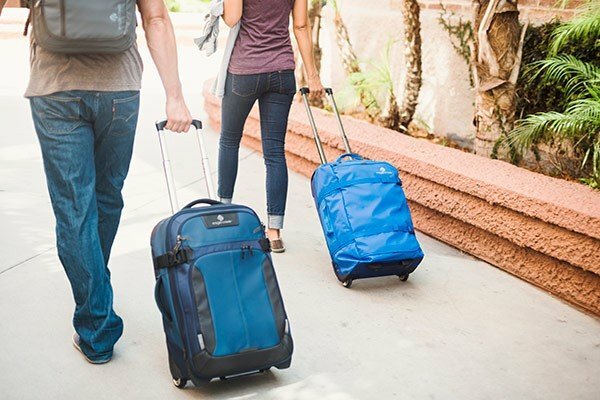 Don’t spend money on your luggage fees. Backpacking is better. This is not woman sentence, I know. But if you compare the money you have spent in your last two or three trips, for your luggage, you can recognize you could have spent this amount for another trip, maybe. If you are planning a long trip, don’t take it like a secure plan, you need your clothes and your stuff. But if you plan to get with you more than what you need, please change this way and take off some stuff, you don’t need all your wardrobe for a week abroad. Even we love to buy something abroad, every time we wear it or use it, we will think about this useful souvenir. I know you don’t want to fulfil your personal email, but if it is to save some money, you need to. Especially in particular season, the airline company send a newsletter with good discount or offer. Some airline like Wizz Air or British Airway offers a discount for their loyal customers. Sometimes, the airline will update you on their offer and their chance to book the ticket in advance with a cheap price. Signing up the airline newsletter you can accumulate points and change it for miles and airfare ticket. This value is applicable also with some credit cards, like American Express or British Airways Credit Cards. Low fare company don’t do any mile discount or point collection. If you have any other advice and suggestion to make this post more helpful, please drop us a line. We will be really happy to include it and put your name on. Have a nice new trip abroad.